Starting from this month, I want to make a run through of all of the films that I am really excited to see for the month. I have been lacking in going to the cinema, and because of that I have missed some films recently that were on my anticipated list for the year. I hope that me documenting the films I actually want to see makes me go out, see them, and then gives me the motivation to review them. I will not be including A Star is Born onto this list as I have already seen it (check my review for that film here) but just note that it definitely was on the list. Venom - Yes, just like everyone else, I have heard the early reviews on this one. However, I still feel like Tom Hardy is the perfect cast for the character of Eddie/Venom and this is one that I have fancied checking out for a while now. Mandy - I had not heard a single thing about this film until a few weeks ago, and all I hear is praise for the art style, the acting and the uniqueness of the film. I love films like these and on a plus note, it has Nicholas Cage in it. I'm sold. Bad Times at the El Royale - With the script written by the people behind The Martian and starring Chris Hemsworth, that is already a promising start. The first trailer to this was stunning visually and I cannot wait to check this one out. First Man - One date and three good movies released in the UK. This will be my priority though, as I already vow to any movie that Chazelle directs. If this Chazelle/Gosling partnership is even 10% as good as La La Land, I will be over the moon. 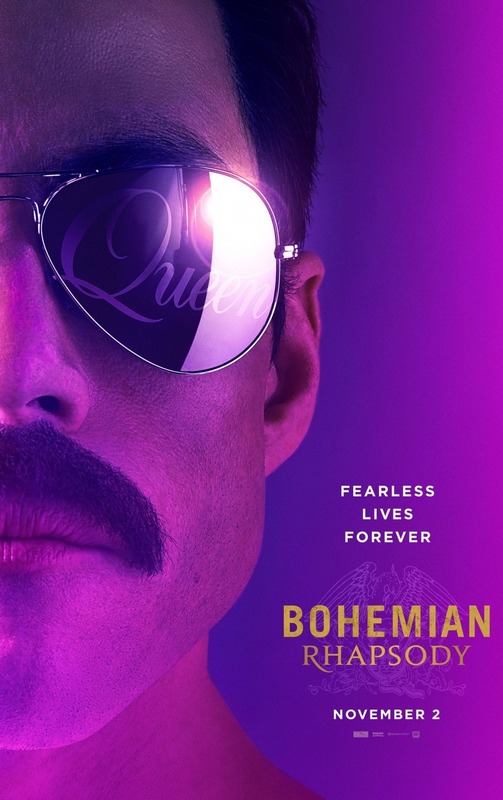 Bohemian Rhapsody: Do I even need to explain why a Freddy Mercury documentary-style movie starring Rami Malek is a must watch? We've all seen the trailer, we've all loved Queen's music at some point, we all know this has potential for Oscar buzz. The cinema isn't the only place offering good entertainment this month. Running through the streaming services in the UK (Netflix, Now TV and Amazon Prime), there is some exciting content both new and old to have a look at. On the 19th of October, Netflix is treating us to season two of Making a Murderer as well as season three of Marvel's Daredevil and whilst I cannot say that I am caught up with either series yet, I know people who are excited about one or the other. Netflix are also uploaded films such as Tinker, Tailor, Soldier Spy and Thelma and Louise onto the service this month, so keep an eye out for those. Now TV are particularly doing well in terms of their film releases. This month sees Black Panther, Downsizing and Coco all being put on the service, so if you missed any of those films in cinema I highly suggest you catch up on them when they appear. Amazon Prime have also stepped up their game majorly, uploading a bunch of Halloween films, such as Lights Out, Scream 2 and 3, and a bunch of the Halloween films ready for the new film released this month. Other franchises for Amazon Prime include their new Purge TV show released every Tuesday, as well as uploading the Lord of the Rings franchise ready for their new TV show currently in production. Is there any films or TV shows that you think I have missed from my list? Are you looking forward to any of the new projects I recommended? Let me know in the comments below and I will make sure to check them out.